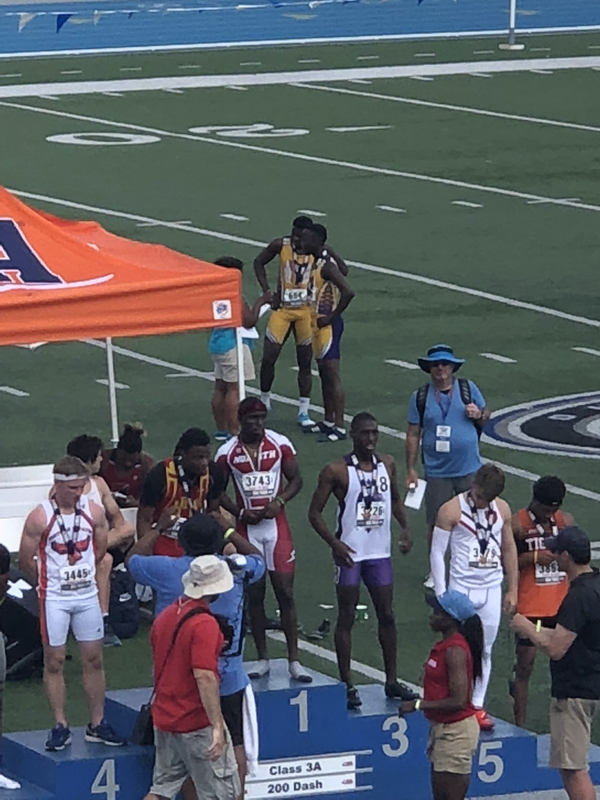 4x100m(Malcom Burns, True Barbour, Kyler Williams, Jay Stewart) Relay did not make finals. Jay Stewart finished in 3rd place in the 100m Dash! with a new personal best time of 10.62 breaking his own F/S School record and just missing the overall school record by .02 seconds. Jay Stewart also finished 3rd place in the 200m Dash. 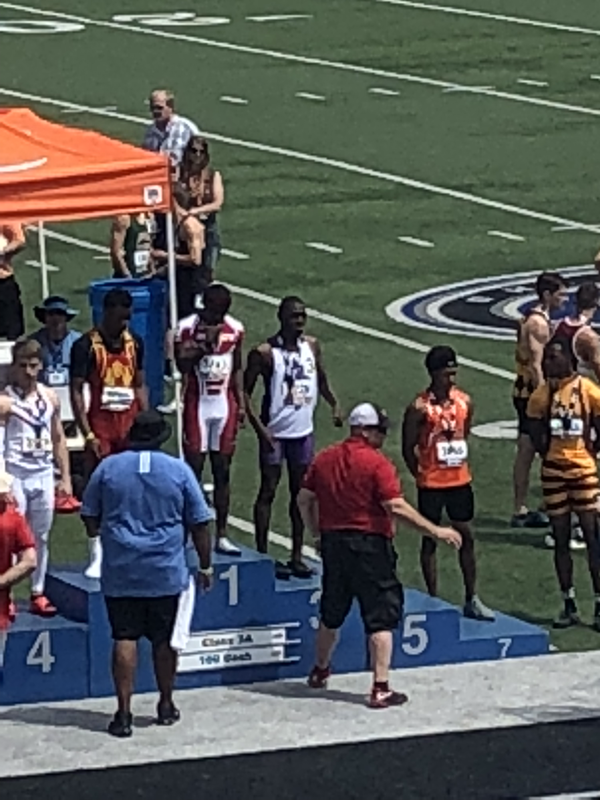 Jay Stewart receiving his 3rd place medal for the 200m Dash. We had a great day today. We had 3 State qualifiers today. Check out our newest page on the website, the Fresh/Soph Top Ten. This is a new feature on the website and it is a work in progress. I am trying to find as many results as I can to put on the list. So its not a All time F/S top ten, but it is a 2008-present f/s top ten with older results sprinkled in as I find them. Today we had a great overall meet, almost every athlete had at least 1 personal record! Jay Stewart won the 100 and 400, he was our only event winner. 800m - Stevie Green had a pr of 2:04.55 which ranks him the #4 Freshman in the state! 400m - Jawuan Ford had a pr of 51.94 and that makes him the #5 Freshman in the state! 300m Hurdles - had a PR of 42.04 and got him the #9 spot on our Top Ten! 1600m - Benny Hernandez with a 2 second PR! 1600m - Nate Stehman with and 8 second PR! 4x400 Relay - Jay Stewart, Jawuan Ford, Stevie Green, Liam Driscoll broke our F/S School record by 2 seconds for a 3:27.90!!! Great meet today at Triad. We had several athletes get a personal record. We had 1 Freshman/Sophomore School record broken! Pole Vault - Braden White (12-0) and Chance White (11-06) both had a PR! Long Jump - Kyle Crone (19-7.50) and Damien Clark (18-03) both had a PR! 4x400 - We had a great race winning the F/S division by 2 seconds. We had a season best time. We were trying to break the F/S school record, but just missed. We will give it a try again at the F/S meet on Tuesday in Granite City. We finished 3rd place tonight in the Large School Madison County meet. We had some great performances and a lot of athletes place tonight. The top 6 finishers scored points at this meet. We also had several athletes with Personal Records or Season Bests! We won 4 events tonight! Shot Put - Dustin Petty 3ft PR! 4x400 Relay(Liam Driscoll,Jawuan Ford, Stevie Green, Noah Bailey) - Season PR for us. We had some great competition today and we had a lot of great performances. The F/S relay team of Kameron Sloan, Liam Driscoll, DJ Powe, and Kyler Williams won both the 4x100 Relay and the 4x200 relay! The F/S relay team of Theo Paxton, Axel Muniz, Chase Giacoletto, Stevie Green broke the F/S School Record and got 9th place on our Outdoor Top Ten list! Sophomore Jay Stewart stared out the day with a false start in the 100m Dash, but did not let that get him down. Jay came back in the 400m dash with a win and then with not a lot of rest finished 3rd in the 200m dash. The meet today was super windy and not very warm. The wind actually caused them to cancel the pole vault! The 100m dash and the 110m Hurdles were hand timed because they did not have an extra camera set up so that they could be ran the opposite direction. We had some fast 100m times, but they were with a tailwind of about 20mph! Besides the poor conditions we had some great performances with PRs and some Top Ten performances scattered throughout the meet! ​Great weather finally! It was a little windy tonight, but at least there was sunshine and no rain or snow! We had 1 school record, a lot of PRs tonight and some other athletes get on the All Time Top Ten! Sophomore Jay Stewart tied the 200m school record from 2012 of All Stater Kennedy Mayweather of 21.60! This is also breaks his own Fresh/Soph School record of 21.98 from last year. Jay Stewart also won the 100m with a season best time of 10.89. Today we finished second at this meet. We came away with 6 first place finishes, and lot of Prs! We won the 100,200,300 hurdles,4x1,4x2,4x4. We also 3 second places in the 110 hurdles, 400 and the 800. Today we finished 3rd place. We had several people get Prs or come really close. Jay Stewart won the 100,200, and 400. Gabe Miller had a 2ft PR in shot put!! He had a 8ft Pr in Discus!! Chris Cloud had a 19ft Pr in discus!! Today we finished in the 3rd place. We had 2 event winners and they were Dustin Petty in the Shot Put and Jay Stewart in the 100m Dash. We had several athletes get PRs and some made it on the All Time Top Ten List! Our Freshman/Sophomore 4x800 got on the All Time Top Ten in 9th spot and broke the Fresh/Soph School Record! The Distance Medley Relay go on the All Time Top Ten in 6th spot! Dual Meet at O'Fallon has been moved to Wednesday 3/28/18 at Collinsville High School. We had another great indoor meet! Almost all the athletes had Pr's at this meet. We had 1 athlete win 2 events, Jay Stewart won the 60m and the 200m. His 60m time was a new indoor school record. We also had several athletes get on the Indoor Top Ten list. We had a great start to the season at the Triad Knights Indoor Invitational. We had several athletes make it onto our Indoor Top Ten List. We also had an Indoor School Record. Jay Stewart broke the school record in the 60m dash with a time of 7.00 he probably would have broken the 200m record also, but the starter had the athletes lineup at the wrong starting line. He ended up running about 188m instead of 200m, oh well maybe next meet he will get it. Here are the athletes that got on the All Time Collinsville Indoor Top Ten list. Practice has started. If you are interested in track you need to be meeting on the balcony in the gym at 3:10 after school. Make sure to get in your paperwork and athletic fees. 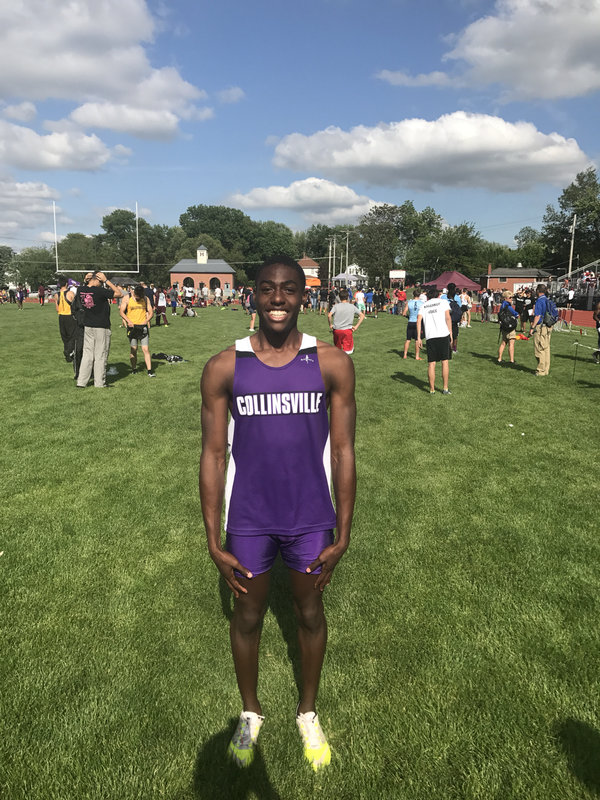 Congrats to Freshman Jay Stewart on breaking the school record in the 400m during prelims on Friday and placing 5th place on Saturday during the finals! Tonight we placed 5th out of 17 teams at our sectional! 4x100 Relay - Sectional Champions and New School Record! Tonight we placed 4th in the conference. We had 2 Conference Champions Jay Stewart in the 100 and Trevore Sanders in the 200. We also had 2 JV Champions Kyle Crone in the Triple Jump and Chance White in the Pole Vault. Jay Stewart also broke the F/S Record in the 400m Run and just missed the overall school record. Our 2 individual Southwestern Conference Champions! Congrats to Jay Stewart on winning the 100m Dash with a PR of 10.81!! The meet ended up getting cancelled, but we did get some events done. We Placed 3rd out of 6 teams tonight. Jay Stewart was an individual County Champion and the 4x200 of Jay Stewart,Trevore Sanders, Malcom Burns, Rhett Romanik were County Champs as well. Congrats to Jay Stewart on winning both the 100m and 200m Dash and breaking the meet record in the both. We had several great performances tonight at this meet. They did not keep team scores, but they gave medals to the top 7. Our 4x200 Relay broke the meet record! Our 4x100 Relay broke our F/S School record! We had some great performances today and a lot of Pr's!! The 4x200m Relay of Malcom Burns, Jay Stewart, Kyler Williams, and True Barbour broke the Freshman/Sophomore school record! Jay Stewart broke the Fresh/Soph school record in the 100 and this was also number 5 on the CHS Top Ten. 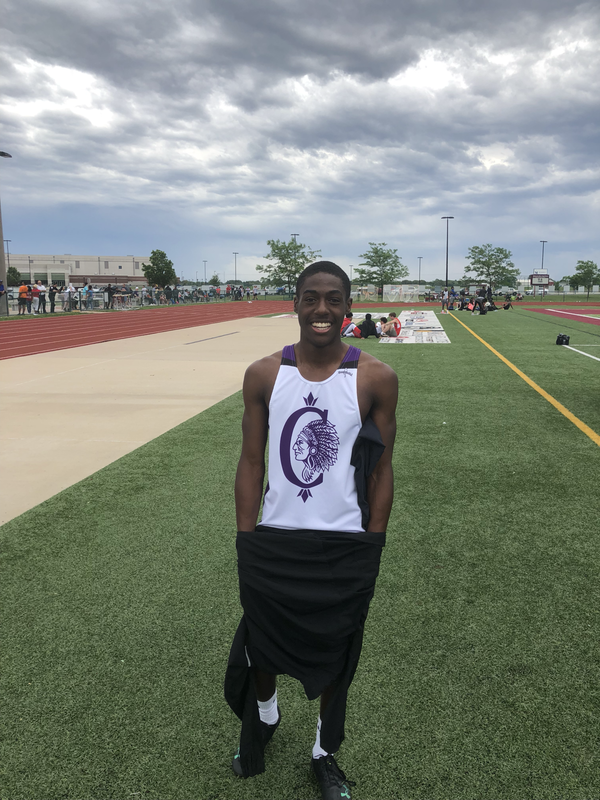 Jay Stewart broke the Fresh/Soph school record in the 200 and this was also number 3 in the CHS Top Ten. ​We had a some PR's tonight and a few athletes get on the top ten. For our first big outdoor meet of the year we had a bunch of great performances. There was a lot of people that showed some great character traits that we like to see in athletes! This was our first outdoor meet of the season and it was a cold windy night. We had several athletes win events tonight. We did win the meet. We had some winners and 1 relay made it on the Top Ten List. We had one winner at this meet Trevore Sanders in the 200m Dash. Some other athletes got on the Indoor Top Ten. We had a great first meet of the season. We broke 2 Indoor school records and 12 Indoor top ten performances. Trevore Sanders tied his school record in the 60m Dash and he broke his own record in the 200m dash. Congrats to our 4 State Qualifiers from tonight! Daniel Brown Sectional Champ in the Pole Vault, Bailey Crone in the High Jump, Amron Cooper-Hodges in the Long Jump and Zach Hammel-Brown in the 300m Hurdles. They will compete at EIU next Friday in the prelims of the IHSA State meet. We had 2 conference Champions this year! Daniel Brown in the Pole Vault with a new school record, and Bailey Crone in the High Jump. We had 3 other events were people were All-Conference: Bailey Crone Triple Jump, Amron Cooper-Hodges Long Jump, and Zach Hammel-Brown 300m Hurdles. We had an awesome turn out for our home invite this year, we had 32 teams represented, this was our biggest Invite yet. We had 6 meet records broken!! We would like to thank everyone that came out and made this meet a success! ​We finished 2nd in the meet this year. We had 4 Madison County Champions! Zach Hammel-Brown broke the school record in the 110m Hurdles, this record was from 1949! If that wasn't enough he came back and broke his own school record in the 300m Hurdles. We had one event winner today: Bailey Crone in the High Jump! He went 6'5" Just missing 6'7", this is coming soon for him!! There was not a score kept at this dual meet, so I will just list the PRs from tonight. ​We had some great performances tonight, with the highlight being Zach Hammel-Brown breaking his own school record from last year in the 300m Hurdles!! Congrats to Zach! We had 3 event winners tonight Zach in the 300 hurdles, Bailey Crone in the Triple Jump and Daniel Brown in the Pole Vault. This was our first year attending this meet, and I think it went pretty well for us. This was a good opportunity for some guys to get some medals! They gave out medals to 1-7 places and we came home with some hardware! We had several athletes come away with a Personal Record, and that is what we look for every meet. This was huge meet with some cool windy weather and we came away with some medals and a bunch of Personal Records and Season Best times! This meet was an 8 team meet for just the freshmen and sophomores, and we had a lot of PR's!!! We also had a lot of medal winners, the Top 5 at this meet earned a medal. We had 2 event winners at the meet, Amron Cooper-Hodges in the Long Jump and Daniel Brown in the Pole Vault. The only performance to make it on the Top Ten from the meet was Amron Cooper-Hodges in the Long Jump with 22-07 and this is the #2 Spot on the Top Ten. The highlight of the meet was Daniel Brown breaking the Pole Vault record from 1976! He set a new school record at 14-01!!!! Big Congrats goes out to him for this accomplishment so early in the season. If he would have jumped this at the state meet he probably would be All State, so we have a lot to look forward to this year! We won several events at this dual meet, we don't have the official results yet so I can't post all of the winners. We also had several PR's at this meet. First big outdoor meet of the year. This is a relay meet, so there are a couple extra relays than we normally have and not as many open events. We had some decent times considering how windy of a day it was. We had 2 athletes win their event. Bailey Crone won the high jump and Daniel Brown won the pole vault, and Mason Eads actually tied Daniel but Daniel held the tie breaker. First outdoor meet of the season and we already put some athletes on the Outdoor Top Ten list. Almost all of our meets are timed with Fully Automated Timing systems, so for record keeping purposes we have to add .24 seconds to a hand time. We also had a lot of athletes get a PR (personal record) compared to their times from last year! This was our last Indoor Meet of the season. We finished 4th out of 26 teams. They gave medals to the top 8 finishers and we had several people come home with some hardware!! We also had to athletes break their own school record! Another meet is in the books and another meet with new Indoor School Records!! We Had 3 new Indoor school records! ​Another great meet for the Kahoks. We had 5 Indoor school records and several personal records! Pole Vault - Daniel Brown ties the #1 Indoor Top ten performance. Mason Eads get the #6 Indoor Top Ten performance. Chance White ties his #9 Top Ten perfornane. Long Jump - Amron Cooper-Hodges get the #1 Top Ten performance. Triple Jump - Daniel Brown get the #4 Top Ten performance. Kyle Crone improves his #6 Top Ten performance. 60m Dash - Rhett Romanik ties the #5 Top Ten performance. Jacob Gass ties the #10 Top Ten performance. 60m Hurdles - Zach Hammel-Brown get the #1 Top Ten performance. Chris Ogan gets the #5 Top Ten performance. Justin Goliday gets the #7 Top Ten performance. 4x800 Relay - The relay of Drake Claxton, Jacob Sewell, Will Autenreith, and Richard Alexander get the #1 Top Ten performance. 4x200 Relay - The relay of Zach Hammel-Brown, Bailey Crone, Rhett Romanik, and Trevore Sanders get the #1 spot on the Top Ten. 800m Run - Will Autenreith got the #6 Top Ten performance. 400m Run - Adrian Ochoa got the #8 Top Ten performance. 4x400 Relay - The relay of Zach Hammel-Brown, Jacob Gass, Rhett Romanik and Trevore Sanders got the #5 Top Ten performance. For our first meet of the season we had some great performances! This is hopefully the start of a great season for the Kahok Track Team. High Jump - Bailey Crone finished second with a new indoor school record of 6-04. Juan Garth got a #6 Indoor Top Ten performance. Pole Vault - Daniel Brown finished second tying the #2 Indoor Top Ten Performance. Mason Eads got a #6 Indoor Top Ten performance. Chance White got a #9 Top Ten performance. 60m Hurdles - Zach Hammel-Brown finished 3rd and got a #2 Indoor Top Ten performance. 60m Dash - Trevore Sanders finished 2nd and got a new indoor school record. Rhett Romanik got a #9 Indoor Top Ten performance. 4x800 Relay - Drake Claxton, Jacob Sewell, Will Autenreith, and Shane Sand got the #5 Indoor Top Ten performance. 4x200 Relay - Trevore Sanders, Bailey Crone, Rhett Romanik, and Zach Hammel-Brown got a #2 Indoor Top Ten performance. 400m Dash - Will Autenreith got a #9 Indoor Top Ten performance. 200m Dash - Trevore Sanders finished 2nd with a new indoor school record. Congrats to our 2015 State Qualifiers!! Bailey Crone- High Jump - Sectional Champion! We finished 2nd place at the meet. The 4x200m relay team broke the meet record and were Madison County Champions! Team members were: Jamal Wellmaker,Rhett Romanik,Tyler Wilson,Trevore Wilson. This same relay was also the 4x100m relay Champions. This is our third dual meet we have won this year! That is the first time since Coach Frerker has been here that we have won all 3 dual meets! Great job guys! We had several event wins tonight and a lot of PR's! Trevore Sanders Broke the Fresh/Soph School Record in the 100m Dash also #6 on our Top Ten and placed 7th at the meet. We had another good showing for our first big meet of the outdoor season. We placed 3rd out of 10 teams. We had a few winners and several medal winners(Top 6). Had some great performances for the first outdoor meet of the year. It was not that great of weather like we anticipated, but you deal with the conditions the best you can! We had a lot of guys try new events out today and did a great job for their first attempt at these new events. Long Jump - Amron Cooper-Hodges won(#6 on Top Ten), and Jacob Gass and Zach Hammel-Brown both attempted long jump for the first time. Jacob placed 2nd! Shot Put - We had several PR's. Connor Highlander(8ft Pr), Jacob Leezy(1ft Pr), Tanner Hails(6ft Pr), Chandler Miller(3ft Pr), and 3 first time throwers Chris Walker, Dustin Petty, Dorian Wren all had good first meets. Discus - Another huge group of Pr's for this event. Harrison Wethers won with 154-00, and this is the farthest distance any Kahok thrower has thrown and the first meet of the season! (4ft Pr), John Floyd 2nd place(5ft Pr), Kyle Hostetter(11ft Pr), Connor Highlander(2ft Pr), Tanner Hails(10ft Pr), Chandler Miller(12ft Pr) and the 3 new guys Chris Walker, Dorian Wren and Dustin Petty all did great as well. In the running events at a dual meet the times have to be converted to F.A.T. by adding .24 to the hand time. So we did not have anyone break onto the Top Ten list. We had a great finish to the indoor season. We had several All Time Top Ten performances and 2 Indoor School Records. Daniel Brown- Pr'd by 1ft!! in the Pole Vault. Another meet full of great performances! Bailey Crone- tied school record in the high jump, and broke his own school record in the triple jump. Amron Cooper-Hodges- broke the school record in the long jump also winning this event. 4x800 Relay of Richard Alexander, Jacob Sewell, Drake Claxton, and Adrian Ochoa ran a #4 All Time Indoor Top Ten. Tremain Streater- ran #2 Indoor Top Ten Time in the 400m and was on school record breaking 4x400 relay. We had a great start to our season this weekend. Several Indoor Personal Records and it was just the first meet. Zach Hammel-Brown- Placed 3rd in the 60m Hurdles. He broke the Indoor School Record in the 60m Hurdles he was also on the 4x400 that placed 2nd and also ran a #2 Indoor Top Ten time. Trevore Sanders- Placed 8th in 60m dash which was good enough for #2 on the All Time Indoor Top Ten List. He also placed 4th in the 200m Dash and that was a #2 Indoor Top Ten Time. He was also on the 4x400 Relay that placed 2nd and that was a #2 Time on the Top Ten List. Tyler Wilson- Placed 11th in the 60m Dash and that was #4 on the Indoor Top Ten List. He also was on the 4x200 that placed 3rd and that was #2 on Indoor Top Ten. Jamal Wellmaker- Ran a #6 All Time Indoor time in the 60m Dash. He was also on the 4x200 and 4x400 Relays. Martinus Mitchell competed at this meet, This meet was the top Illinois seniors competing against the top seniors from Wisconsin and Iowa. Martinus once again finished 1st place. We had taken a week off of practice, so he wasn't at his top performance. He still managed to throw 59-01! We will now begin to turn up the training and get ready for the United States Track and Field Youth Championships in Oregon and Historic Hayward Field! Here is a website about the meet in Oregon. We had a great sectional meet. We had almost everyone that competed get a PR today! Martinus Mitchell placed 2nd in shot put and discus qualifying for the state meet in both events. This is only the second time all season that he has been beat in the shot put. We are looking for big things this weekend at the state meet in Charleston! The 4x200 Relay of Tyler Wilson, Trevore Sanders, Josh Bailey, and Jamal Wellmaker qualified for state! They were in the slow heat and had no one to push them, but they dug down deep and pushed themselves to get a fast time. The top 7 teams qualified for state at our sectional!! Brendan Peterson Pr'd in the 1600 breaking his own F/S school record and moving up the top ten list to number 8. 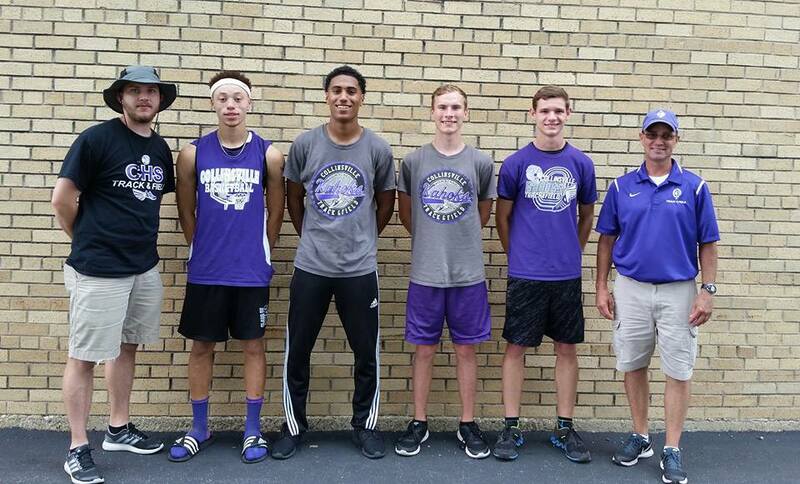 We will leave Thursday afternoon for the state meet hosted at Eastern Illinois University in Charleston. We hope to see you there! Southwestern Conference Meet at Alton. The is a JV and Varsity meet ran together. We had a lot of PR's on both levels. At this meet the top 8 finishers score points. Martinus Mitchell was our only Southwestern Conference Champion. He won the Discus and he also won the shot put! His shot put throw of 61-8.5 was new school record. This throw is also #1 in IL and #19 in US! Harry Uyehara Pr'd by a foot in the shot put and placed 4th. He also placed 5th in the discus. Bailey Crone placed 5th in the high jump and 6th in the triple jump. His triple jump is a new PR and also a new F/S school record! Ryan Brunton placed 3rd in the pole vault. Alex Smith placed 4th in the pole vault. Our only Champion from the JV meet was Harrison Wethers in the discus. This is the second year in a row he was the JV discus champion. He had a personal record of 150-03. This would have placed him 6th in the Varsity meet. We will be looking for him next year to fill the Big shoes from our graduating seniors. Harrison also had a 1ft 2 in PR in the shot put good enough for 4th place. John Floyd placed 2nd in the shot put with a 1ft PR. and he placed 5th in the discus. He will also be looked upon to fill the big shoes vacated by the senior throwers. Connor Highlander had a PR in the Pole Vault and placed 4th. Chazen Logan-Edwards Pr'd in the 110H Hurdles and placed 8th. Will Autenreith Had a PR in the 800m run and placed 8th. Once again we had a tremendous turn out for our Invitational. We would like to thank all the parents, athletes, and coaches that help make this one of the great meets all year. We placed 4th in this meet, which is the highest we have ever finished at our own meet. So congrats to the athletes on a great day of competition. The top 8 athletes placed at this meet and we had several do this. Martinus Mitchell won the shot put breaking his own school record again with a toss of 60-02.5. This is the second farthest throw in the state and the 32nd best in the United States. He also placed 3rd in the discus with a new season best of 166-04. Harry Uyehara had a new personal record in the discus 167-11. He won this event. He also placed 8th in the discus just 7 inches behind his personal record. Bailey Crone placed 8th in the triple jump and 7th in the high jump. His triple jump is a new outdoor personal record and also breaks his own fresh/soph school record. The 4x200 of Josh Bailey, Tyler Wilson, Jamal Wellmaker, and Trevore Sanders placed 6th with a season best time. This time puts them number 2 on the All Time Kahoks list! Brendan Peterson had a personal record in the 1600m run of 4:46.57 breaking the Fresh/Soph School record by .03 seconds! This also puts him number 10 on the All Time Top Ten. The 4x400 of Josh Bailey, Treamain Steater, Rashaun Hall, and Jamal Wellmaker placed 8th with a new season personal record. This is the number 7 All Time Kahok time in this event. Former Kahok school record holder, Bernard Birger, in the shot put from 1971 came by to meet Martinus and congratulate him on breaking the school record. This was a great meet with some windy conditions today. We had several performances that made the Top Ten list and even a new Fresh/Soph School Record! Top 8 scored points and top 4 received a medal at this meet. Bailey Crone placed 7th in the Long Jump, 4th in the Triple Jump, and 5th in the High Jump. Jacob Leezy had a 17ft PR in the Discus to place him 8th!!! Tyler Wilson placed 2nd in the 100 and 200. His 100 time is good enough for a new Fresh/Soph School Record and number 8 on the All Time Top Ten List. His 200 time is good enough for number 6 on the All Time Top Ten List! Trevore Sanders placed 3rd in the 100 and 200. His 200 is number 9 on the All Time Top Ten List! Daniel Brown placed 8th in the 800 scoring 1 point. The 4x200 ran a great race finishing second just missing the Fresh/Soph school record by .1 seconds. Team members were: Jacob Gass, Rashaun Hall, Trevore Sanders, Tyler Wilson. The 4x400 Placed 8th. 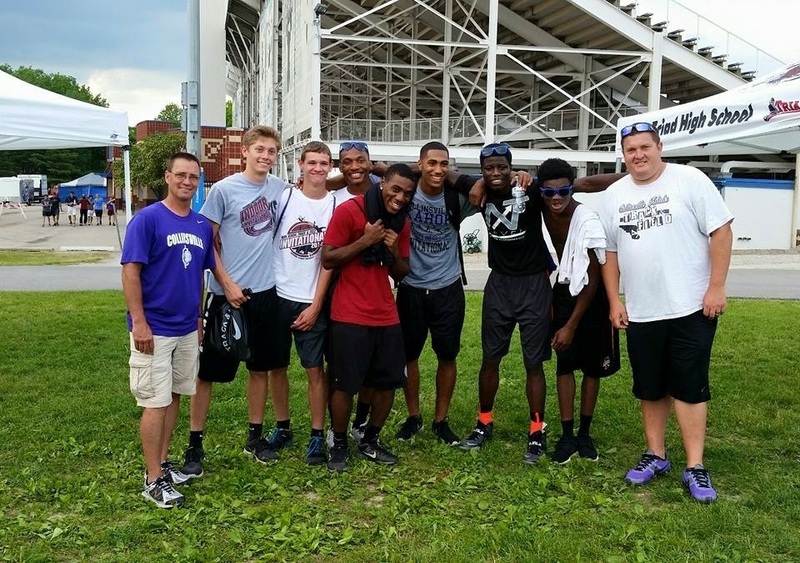 The team consisted of Rashaun Hall, Zach Hammel-Brown, Jacob Gass, and Amron Cooper-Hodges. Mason Eads placed 3rd in the Pole Vault going 10-00 to take the number 10 spot on the All Time Top Ten. Connor Highlander placed 6th in the Pole Vault. Kind of a cold and windy day, but we competed very well today! We placed 2nd place overall in this meet. This is the best we have finished since Coach Frerker has been the Head Coach!! We had 6 individual Madison County Champions on our team this year! The top 6 in each event score points at this meet, so I will list our event point scorers. Harry Uyehara won this Discus with a new PR of 167-08! He was also 4th in the Shot Put. Martinus Mitchell won the Shot Put with a New Meet Record of over 50 years old! The throw of 59-11 is also a new outdoor school record and his farthest outdoor throw so far. This throw ranks #1 in IL and #29 in the US. Alex Smith won the Pole Vault and Ryan Brunton finished 2nd! Tremain Streater won the 400m Dash. Zach Hammel-Brown placed 4th in the 110m Hurdles and 3rd in the 300m Hurdles. Trevore Sanders was 6th in the 100m Dash and 4th in the 200m Dash. The 4x200m Relay of Josh Bailey, Trevore Sanders, Jamal Wellmaker, and Tremain Streater were 3rd place. The 4x100 Relay of Josh Bailey, Trevore Sanders, Jacob Gass, Jamal Wellmaker finished 3rd. Ryan Brunton finished 6th in the 300m Hurdles to go along with his 2nd place finish in the Pole Vault. This was great meet with great weather again. They top 8 scored points and the top 6 got a medal. Martinus Mitchell was 2nd in the Discus and 1st in the Shot Put with a new meet record of 57-10! We dodged the rain with this meet. We had some great performances today. We had a bunch of guys try running some new event and they came away with great times! Great meet today, this was the nicest weather for a track meet that you could hope for. We were missing a few athletes today due the holiday weekend. We had 2 event winners today! 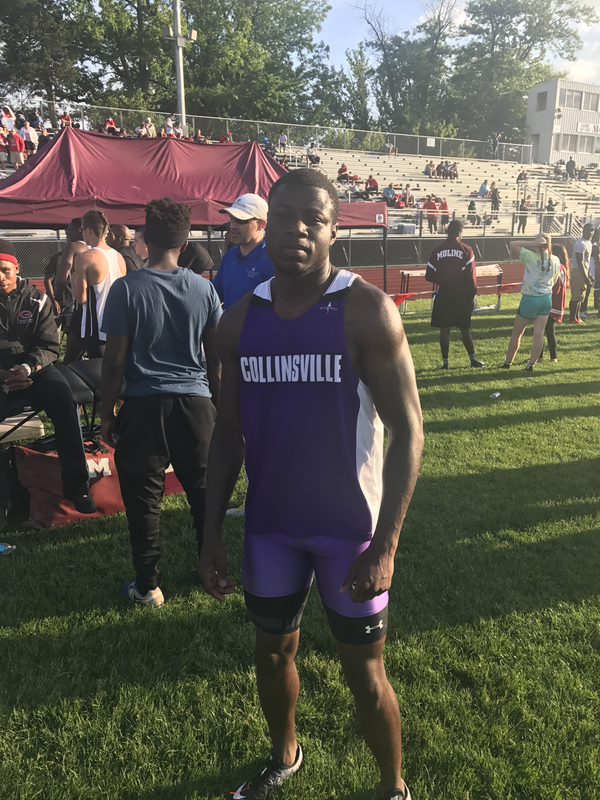 Tremain ran a PR in the 400 49.33 for the win with a #2 All Time Kahok Performance, and Martinus Mitchell won the Shot Put with a New Outdoor School Record 58-01! This record was from 1971! This is the farthest throw right now in Illinois! In the throws Harry Uyehara placed 3rd in discus and 7th in the shot put and Martinus Mitchell placed 2nd in the discus and 1st in the shot put. The 4x800 had a season PR with a time of 9:09.52 team members were Brendan Peterson, Bryce Whitehead, Drake Claxton, and Trey Hawk. Trey Hawk had a Season PR in the 1600 and Bryce Whitehead also had a PR in the 1600. Tyler Wilson also had a PR in the 200m dash. 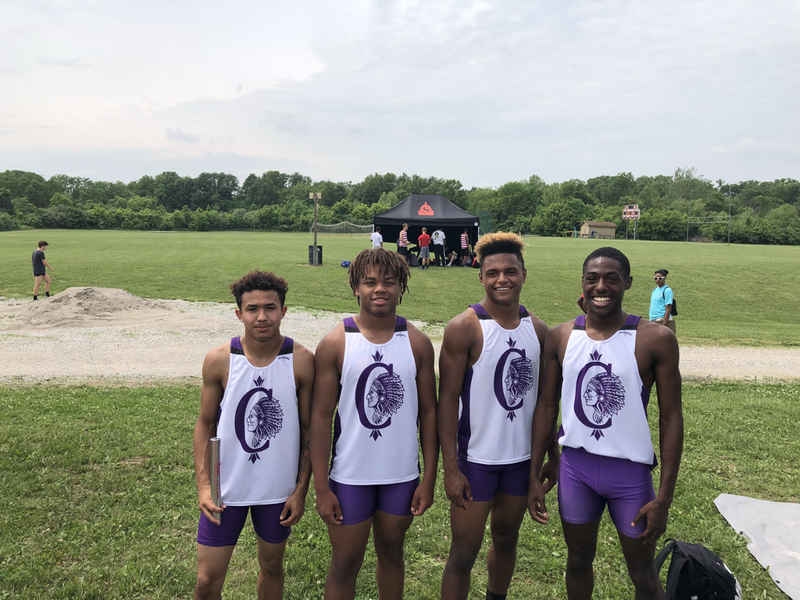 The 4x400 ran a season PR and #8 on the All Time Top Ten Kahok list, team members were: Jamal Wellmaker, Josh Bailey, Tremain Streater, and Zach Hammel-Brown. We had nice warm weather for this meet, but the wind was very strong. This is the biggest meet we have been at all year, and is one of the best meets in the state so far this season. There were a total of 27 teams represented!! Our highest individual place at this meet was 3rd place by 2 athletes, Ryan Brunton in the pole vault and Tremain Streator in the 400m dash. Tremain also PR'd and moves him to #6 on the All Time Kahok list, he is also ranks him #8 in the 3a state rankings. In the throws we were missing All Stater Martinus Mitchell, who was taking the ACT. In his absence Harrison Wethers stepped up with a PR in the discus placing 7th. Harry Uyehara had an off day and still placed 6th in the Discus, he is still ranked 7th in the 3a state rankings in the discus. Zach Hammel-Brown PR'd in both hurdle events! He is getting faster every meet! Trevore Sanders PR'd in the 200m and also ran strong splits on all of his relays. Josh Bailey got passed with 200 left in the 4x400 and came back and passed the other team with 50m to go and we won our heat with a season best time, other relay members were Trevore Sanders, Jamal Wellmaker, and Tremain Streator who had a great split to go with his great open 400 from earlier in the day. Drake Claxton and Daniel Brown both PR'd in the 800m run. Probably the best weather we have had all season for a meet. This meet athletes received a medal for placing in the top 5. We had 2 event winners at this meet, Bailey Crone with a new PR in the High Jump 6'0" also improves his fresh/soph outdoor school record and moves him up all time top ten list to 4th place. The other winner was Amron Cooper-Hodges in the Long Jump. Bailey also placed 4th in the triple jump. BRENDAN PETERSON placed 3rd IN THE 1600 METER RUN with a new PR 4:56! Our fastest mile of the year! JORDEN MCLEAN placed 5th IN THE 3200 meter run with a new PR! Jacob Gass was 6th in the 100 with a new PR! The day started out with perfect weather and we finished in a steady rain! We had a lot of PR's today, but I can't currently list them all because the only results I have are the Top 3 finishers in each event. Jacob Gass had a PR in the 100m dash. Zach Hammel-Brown PR'd in the 110 and 300 Hurdles. His 300 hurdle time also puts him in 9th on the All Time top 10 list! Harry Uyehara won the discus with a great throw of 161-10 and that throw ranks him 7th on our All Time top 10 list. Harrison Wethers placed 3rd in the discus just 2ft shy of his PR. Martinus Mitchell Won the Shot Put in the rain, but it was well behind his Indoor distance. The rain made this a difficult competition for all the Varsity throwers. Alex Smith placed 2nd in the Pole Vault tying his PR and that puts him 4th on our All Time Top 10 list. Ryan Brunton placed 3rd in Pole Vault, and his jump ranks 5th on our All Time Top 10 list. Amron Cooper-Hodges won the Long Jump with a #2 All Time Top Ten Kahok jump of 22-02! This is also a Fresh/Soph School Record! Only his second meet as a High School track athlete. The 4x400 relay won their race! While the rest of the team was at the first outdoor meet of the Season Coach Burgess took Martinus Mitchell and Tremain Streator to this meet. This meet was the top 12 in each event from the whole state of Illinois. They consider this meet the Indoor State Championship. The top 8 finishers received medals in this meet. Martinus had the number one throw coming into this meet so he had the luxury of being the last thrower, and he took advantage of that. On the very last throw of the competition Martinus,who had dropped to third place, had a throw of 57-08 to win the meet! Martinus remains undefeated on the season! Tremain was in the 400m run. Tremain was running a great race and right when he was going through the finish line he had another athlete run into him head first. He ended up finishing in 9th place, but he had a strong showing and gained some valuable experience from this event. This was our first outdoor meet of the season, and it was cold, wet, and windy. We had some good performances even with the cold temps. The Kahok of the Meet was Alex Smith, he was our lone event winner today! In the throws Harry Uyehara placed 3rd in the discus and 8th in the Shot Put. Harrison Wethers had a 7ft PR in the discus with a throw of 142' and he placed 4th. Alex Smith was the only winner of they day, he won the Pole Vault at 12'. This also puts him at 4th all time. In the Long Jump newcomer Amron Cooper-Hodges placed 3rd! This was his first every high school competition. He jumped 20' 1". Also putting him at 6th Place on the All Time School list! Bailey Crone tied his indoor PR in the high jump with at jump of 5' 10" This ties the Fresh/Soph school record! We had another decent outing today at the meet at EIU. There was some very tough competition in all of the events. They handed out medals to the top 8 at this meet. Another great meet for Martinus Mitchell, he remains undefeated on the year. He threw a whopping 60-10. This throws is the farthest in state of Illinois and the 14th farthest in the United States. The is the 6th best indoor throw in Illinois since 1999! His throw also breaks his own indoor school record and the meet record. This is his second meet record of the season! This throw is also farther than the outdoor school record set in 1971(57-5.75), so hopefully when we get outside he can break the outdoor school record! Tremain Streator had another strong showing in the 400m dash placing 5th in a very tough meet. He also ran a great leg on the 4x400 relay. Bailey Crone was real close to his PR in the high jump today placing 12th in that event. The 4x400 relay of Tremain Streator, Trevore Sanders, Josh Bailey, and Jamal Wellmaker placed 6th. We just missed out on 5th by.03 seconds. This team broke the indoor school record! Brendan Peterson and Drake Claxton both had season PR's in the 800m. Trey Hawk and Bryce Whitehead also had season PR's today in the 1600m. Great meet at Principia. We Broke the Indoor School Record in the 4x400 relay, Relay members include Tremain Streator, Max Lyons, Jamal Wellmaker, Trevore Sanders. Martinus Mitchell broke the meet record and the Indoor school record in the shot put. John Floyd also had a PR in the Shot Put placing 10th. Ryan Brunton placed 3rd in the Pole Vault tying his own indoor school record and Alex Smith placed 5th. The 4x200 Relay placed 5th with a new season PR. Tremain Streater placed 2nd in the 400m with a new indoor PR with a great race against 2 Cahokia runners. We had a pretty good meet for the second indoor meet of the year. Top 6 finishers in every event got a medal at this pretty big indoor meet. Martinus Mitchell won the shot put with a New Indoor School Record 56'6.5" which ranks him 2nd in Illinois and 51st in the US! There is still a lot more to come from him this season! CHS throwers have won this meet 3 ouf of the last 4 years! Good job guys!! Ryan Brunton tied his indoor school record 12'6" tying for 5th place in the meet. Alex Smith had a season PR of 12'0" tying him for 9th place. We had a great first meet at Principia College. This was our first trip to the Triad Indoor Invite, we hope to make this an annual trip. We gad some great performances for our first meet, and for being so early in the year! Martinus Mitchell won the shot put. Harry Uyehara placed 4th in the shot with a 1ft pr over his outdoor best from last year! John Floyd place 11th in shot with a 4ft pr in his first varsity competition. Ryan Brunton tied his outdoor pr and broke the indoor school record placing 2nd in pole vault. Our Fresh/Soph 4x2 and 4x4 relays both placed 2nd in the f/s races. And our Kahok of the meet was Bailey Crone! He placed 7th in high jump with a pr and new indoor school record, He placed 10th in long jump with an indoor pr, and he placed 3rd in triple jump with a pr and new indoor school record! Congrats Bailey! this season! See everyone next year! third in the Pole Vault and was our highest placing finisher in the meet. so they will compete at Principia High School on Monday. 166'10". Ranking him 5th in the 3a and 10th overall in Illinois. normally get to. We lost the meet to Triad by a score 78-67. There were a lot of PR's. 4x800- J.Bailey, R. Hayes, B. Staves, T.
had quite a few PR's today! several PR's, it's been as busy week, I'll post PR's later. Smith both Tied their PR for Pole Vault. first meet there are a lot! Logan-Edwards Kenny Childress, Dorian Wren. Brown, Zach Novero, Jake Bednara, Jared Drake. Highlander, Shawn Vlcek, Jacob Leezy, Nich Janini. 4th in the 3a state polls! His throw also is ranked #78 in the US! You can see he throw on our Youtube Channel "KahokThrows"